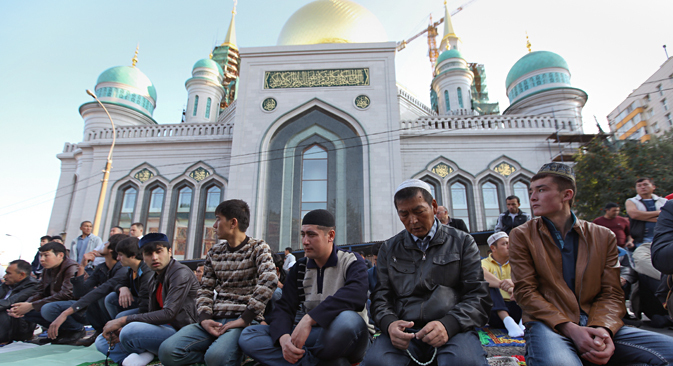 Ahead of the Muslim holiday of Eid al-Adha (Feast of Sacrifice) on September 23, a new central mosque was thrown open to the public after a special ceremony in Moscow. The central Moscow mosque (Moscow Cathedral Mosque) was demolished and rebuilt and is now one of the biggest in the country. Its minarets are 72 meters tall and its central dome is 46 meters high. It will be the second largest Muslim prayer facility in Russia after the Salawat Yulayev mosque, which is being built in Ufa. The new Moscow mosque has nearly 20 times as much space as the old building and will be able to accommodate up to 10,000 people. The mosque has seven elevators, air conditioning and is disabled-friendly. The reconstruction of the mosque cost $170 million, with most of the money being donated by Russian businessman and senator Suleyman Kerimov in memory of his father. The list of donors also includes Palestinian leader Mahmoud Abbas, who donated $26,000 on behalf of Palestinian children. While Turkey has donated a minbar, the pulpit from which the imam delivers Friday prayers, and a mihrab, a semicircular niche in the wall that indicates the direction of Mecca. The walls and ceilings have traditional Russian ornamental inscriptions, which were carved by Turkish craftsmen. The dome and pavilions are covered with 12 kg of gold leaf. The architects decided to cover the domes of the mosque with gold to blend in with the Moscow skyline, which is dominated by golden domes of its churches. The plot of land in Vypolzov Lane, where the Moscow Cathedral Mosque is located, was purchased by Tatar merchants in 1902. The original mosque was built in 1904 and remained at this site until it was demolished in 2011 as part of the refurbishment project that started in the spring of 2005. The Council of Muftis said reconstruction was necessary since the old building had partially caved in and was no longer safe. According to various estimates, during major religious holidays, up to 100,000 people gather outside the central mosque alone. This leads to overcrowding of nearby streets and spaces.